It's no secret that I'm a fan of utilizing quality books in our homeschool. We are a Charlotte Mason inspired homeschool after all, so we incorporate living books full time around here. Recently we were given the opportunity to review a new history series brought to you by Carole P. Roman and Awaywegomedia.com. 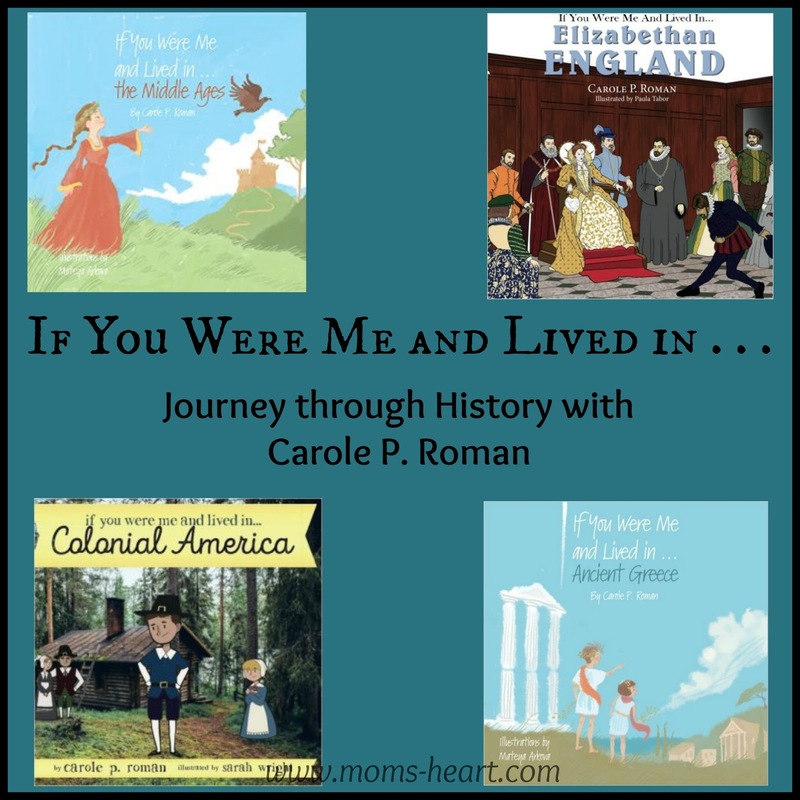 Her series offers children the perfect opportunity to see what their life would would be like if they lived in another time in history. This was a fun review, because we were given the opportunity to request two titles, and we would be sent two "surprise" titles. I specifically requested Colonial America, because we're studying Early American History this year, and both boys requested Middle Ages. The other two were our surprise titles. Other time periods in the series include Renaissance Italy, Ancient China: The Han Dynasty, The American West, and Viking Europe. The premise of these books is that children are introduced to a different civilization in history by a child close in age. The books open with a picture of the location in present day compared to what it might have looked like during the time period in focus, and asks the reader to compare them. Then the narrator takes the reader back in time, teaching them about life and culture from the perspective of a child by describing their house, the occupations of family members, famous people of the time, education and more. The helps children to almost see the time period through their own eyes and better identify with how their life would have looked if they had lived then. As soon I read the title, Elliott stopped me and asked, "Wait, like the If You Were Me . . . books from around the world?" I realized that I hadn't mentioned the actual titles of the books when we were selecting the time periods, I just asked for their preference. He made the connection immediately though. We have previously reviewed Mexico, France, South Korea and Norway, as well as Australia, Russia and Portugal. 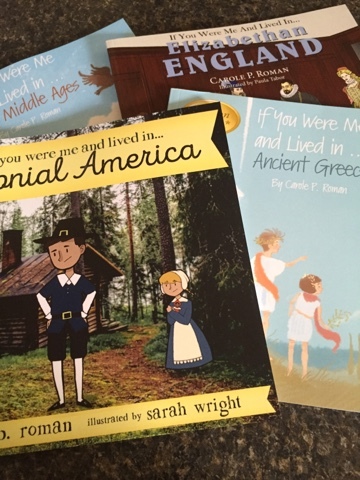 We love, love, loved those geography books, and have bought some on our own, so I was really excited about adding this new series to our history collection! I decided to start with If You Were Me and Lived in . . . The Middle Ages because both boys requested it, and we haven't formally studied this time period in-depth yet. I knew it would make a great read-aloud for lunch time. This book starts us out in the year 1072, learning what our life would be like as a girl named Aalis. Our father came into England as part of William of Normandy's army, and was given land. We learned how this land was used, how the house (a mott and bailey castle) was built, and how the different rooms were used. My boys were a little grossed out by the description of the garter robe and how it emptied into the moat! We read about the food we would have eaten and the clothes worn. I really appreciated how all of these things were compared between "our" family who was considered wealthy, and that of the farmers or peasants. We learned about the process of becoming a knight, the classes of society and the importance of religion, as well as money, education/schooling and entertainment. My boys were shocked to learn that only priests were allowed to read the Bible, and that only boys were educated. This book, at 97 pages, is fairly long compared to the others. The primary part of the book actually ends at page 79, but continues with a section called Famous People of the Middle Ages, where it gives very short snippets of information about people like William the Conqueror-William I, Joan of Arc, Bede, Charlemagne, and others. It ends with a Glossary. I usually read several pages a day during lunch over a couple weeks. You better believe it was jam-packed with information, because that's just such a dynamic time period to try to fit into a children's book. There were so many facts, I know the children were missing things here and there, but honestly, we are reading this for exposure right now. We've read other books about castles and knights and such, but since we aren't actually studying this time period right now, I don't expect them to master the material yet. We'll definitely be using this book again though when we study Medieval History in depth. I decided that our second book in the series would actually be Elizabethan England. Even though it was a "surprise" title, it would make a good bridge between the Middle Ages and the Colonial America book. I somehow managed to time it perfectly to go along with the very beginning of our history study on Pilgrims, as it would help show the life of people leading up to this time period, and because it ends with a discussion of how the people of England were expected to follow the religious preferences of the ruling monarch, which is where our study was starting. The book, like others in the series, takes you through England as a child, exploring the occupations of your family members, names of children and siblings, the clothing they would wear, and the recreational activities they enjoyed. Famous leaders and cultural influences like Queen Elizabeth and Shakespeare were discussed. This book was considerably shorter, about half the size of the Middle Ages, so it didn't take us as long to finish. It was still full of interesting information, and the boys were again grossed out by the habit of throwing trash and waste out of windows. Even though she is presenting facts, Roman knows how to appeal to the humor of boys, that's for sure! This book was requested because we are studying Early American History this year. It begins with an explanation as to why the colonists left England, the hardships they faced, (pleasant) interactions with Native Americans, the feast that became Thanksgiving, and ended with the life of children in the colony. The book is 53 pages, with a few additional pages of famous people from the eastern colonies and a glossary. I really appreciate that even though Roman included Pocahontas, she didn't call her a "princess," and she stated that the story of her saving John Smith is debated. Most children's books include these things as absolute fact, but the author presented it with a more neutral position. We just started studying the Pilgrims, but we're still in the years of Holland, and this book focuses on their time in America, so I decided we're going to use this book as a summary towards the end of our study. It will make a great review for us, and because of her format of exploring history through a child's life, it will probably include interesting tidbits we won't cover in our curriculum. However, it would also make a great introduction to colonial life too. The final book we received follows the same basic pattern as the others. Ancient Greece starts with a two page illustration of current Greece, followed by what Greece might have looked like in 350 B.C, and we're asked to find the differences. We still learn about common names, how the houses were built, what your diet would have been, how girls and boys were educated differently, the clothing people wore, the importance of a man's beard, and other interesting facts about traditional lifestyles. This book is slightly different though, because it gets to talk about how Ancient Greece helped form the foundation for much of western society, and we learn a little about the history of democracies and the origin of the Olympics. It still has a glossary, but instead of a section about famous people, it has a section of gods and goddesses of Ancient Greece. They're also mentioned throughout the book whenever they influenced a way of life. All of the books in this series are longer and meatier than the original geography series. Sometimes there is a lot of text on one page, and it looks crowded for a children's picture book, but the information is interesting. It's understandable that facts have to be packed in, when trying to condense an entire time period into a children's book. The books have various illustrators. Two of ours were illustrated by Marteya Arkova, one by Paula Tabor, and one by Sarah Wright. So even though they are part of a series, the illustrations vary greatly and you may find preference for one style over another. Some of the books had black text on white backgrounds, which I preferred to the colored backgrounds, because it's visually "cleaner" to me. Overall, my family really enjoys these books. My boys are 7 and 9 and both have learned a lot so far! I think they're great for elementary into early middle school to either introduce or review a time period. You could even use them as the basis for a unit study. They are funny and factual, and interesting to read together as a family, and I do recommend them.